How to do scenario analysis in Excel? How to generate scenario summary report using Excel scenario manager feature? You will learn all these crucial data analysis topics in this article. Before analyzing how you will use scenario manager in Excel to do scenario analysis, you better get some idea about the limitations of one and two variables data tables. In data tables, you can vary only one or two input cells at a time. Setting up a data table is not very easy. A two-input table shows the results of only one formula cell. To get results of more formula cells, we can create additional data tables. In maximum cases, we’re interested to see results of selected combinations, not the entire table where the table will show the all possible combinations of two input cells. The Scenario Manager is an easy way to automate some inputs of our what-if models. We can store different sets of input values (they are called changing cells in Scenario Manager) for any number of variables and give a name to each set. We can then select a set of values by name, and Excel shows the worksheet by using those values. We can also generate a summary report that displays the effect of various combinations of values on any number of result cells. These summary reports can be an outline or a pivot table. For example, you have a company and your company’s annual sales forecast may depend upon several factors. Moreover, you can define three scenarios: best case, worst case, and most likely case. You can then switch to any of these scenarios by selecting the named scenario from a list. Excel will substitute the appropriate input values in your worksheet and will recalculate the formulas according to the scenario. 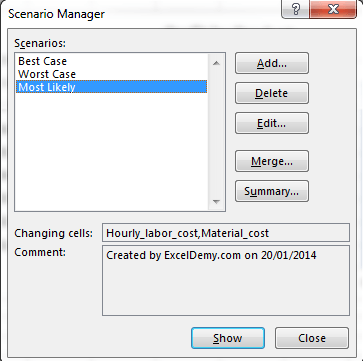 To introduce you to Excel Scenario Manager, we have started this section with a practical example. The example is a simplified production model as shown in the following figure. A simple production model we have used to demonstrate Scenario Manager. The above worksheet contains two input cells: the hourly labor cost (cell B2) and the per unit Material cost (cell B3). The company produces three products, and each product requires a different number of hours and a different amount of materials to produce. 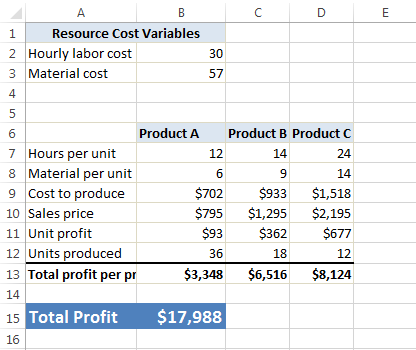 Formulas calculate the total profit per product (row 13) and the total combined profit (cell B15). The company management— trying to predict the total profit, but in an uncertain situation when the hourly labor cost and material costs will be different. The company has identified three scenarios listed in the following Table. As expected, in the Best Case scenario the company will have the lowest hourly cost and lowest materials cost. The Worst Case scenario will have the highest values for both the Hourly Labor Cost and the Material Cost. The third scenario is the Most Likely case. It will have the intermediate values for both of Labor Cost and Material Cost. The company managers must be prepared for the worst case, however, and they will optimize their performance controlling the scenario under the Best Case Scenario. Choose Data ➪ Data Tools ➪ What-If Analysis ➪ Scenario Manager. Scenario Manager dialog box will appear in the screen. When we first open this dialog box, it shows that No Scenarios defined. Choose Add to add scenarios.. It is not surprising because we’re just starting. When we shall add named scenarios, they will appear in the Scenarios list in the dialog box. 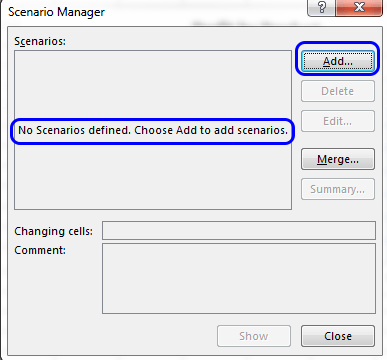 Scenario Manager dialog box. It shows there is no scenario is defined. Using Add button, we can generate the scenario. Tip: Creating names for the changing cells and all the result cells that you want to examine, is a good idea. Excel will use these changed names in the dialog boxes and in the reports that it will generate. Keeping track of what’s going on is easier if you use names. Changed names also make your reports more readable. Click the Add button in the Scenario Manager dialog box to add a scenario. Excel will display the Add Scenario dialog box, shown in the following figure. Using this Add Scenario dialog box to create a scenario. Scenario Name: You can give any name for this Scenario name field. Given name should be something meaningful. Changing Cells: These are the input cells for the scenario. You can enter the cell addresses directly or point to them. If you’ve given names for the cells, type the name. Nonadjacent cells are allowed for this field. If you are required to point multiple cells, press CTRL key on your keyboard while you click on the cells. Not necessarily, every scenario will use the same set of changing cells. A different scenario can use different changing cells. The number of changing cells is not unlimited for a scenario; it is limited to 32. 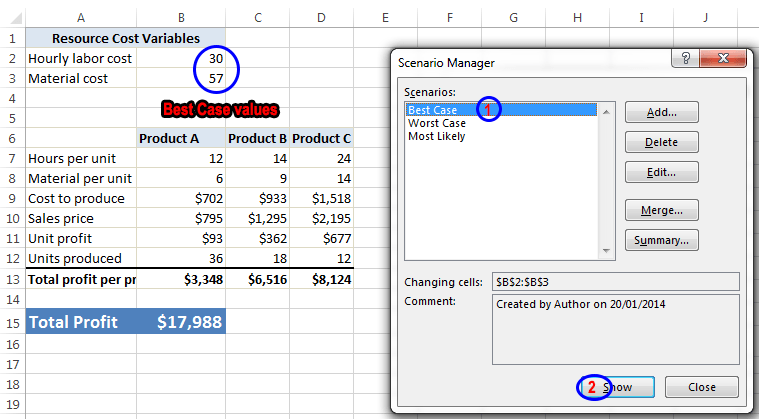 Comment: By default, Excel shows the name of the person who created the scenario and the date when it was created. But you can change this text, add new text to it, or delete it completely. Protection: The two Protection options are preventing changes and hiding a scenario. These two are in effect only when you protect the worksheet and choose the Scenario option in the Protect Sheet dialog box. When you’re protecting a scenario, it will prevent anyone from modifying it; a hidden scenario doesn’t appear in the Scenario Manager dialog box. In our example, we shall define the three scenarios that are listed in above Table. The changing cells are Hourly_Cost (B2) and Materials_Cost (B3). For example, we entered the following information in the Add Scenario dialog box to enter the Best Case Scenario. 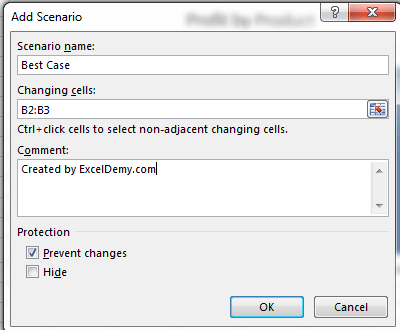 Entered “Best Case” in the Scenario name field, then selected both B2 and B3 cells pressing CTRL to enter values in the Changing cells field, and then edited “Created by ExcelDemy.com on 20/01/2014” to the Comment box. By default, Prevent Changes is check-marked under Protection option. After you enter the information in the Add Scenario dialog box, click OK. Excel will now display the Scenario Values dialog box, shown in the following figure. This dialog box displays every field we’ve entered into the changing cell that we’ve specified in the previous dialog box. Enter the values for each cell in the scenario. We entered the values for the scenario in the Scenario Values dialog box. As we have more scenarios to add, we clicked Add button. When we’re done with entering all the scenarios we shall click OK and Excel will return us to the Scenario Manager dialog box, which then will display our entered scenarios in its list. Now we have three scenarios (Best Case, Worst Case, and Most Likely) listed in the Scenario Manager dialog box. Select one of the listed scenarios and then click the Show button (or double-click the Scenario name) to display the results of the scenario. 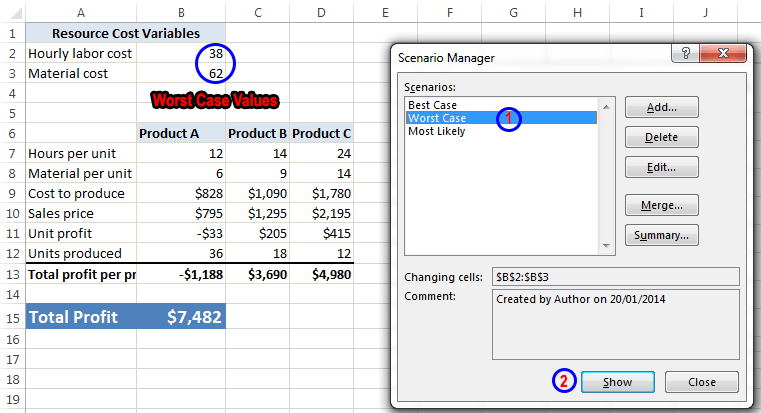 Excel inserts the corresponding values into the changing cells and the results of that scenario are shown in the worksheet. The following two figures show the example of selecting two scenarios (Best Case and Worst Case). From the Scenarios list, select the scenario that you want to change and then click the Edit button.The Edit Scenario dialog box will appear. Change whatever you need to do in Edit Scenario dialog box. You can change the name of the scenario. You can also change the Changing cells field as per your requirement. If you’re done, click OK. The Scenario Values dialog box will appear. Make your changes in the Scenario Values dialog box and then click OK to return to the Scenario Manager dialog box. Notice that Excel automatically updates the Comments box with new text that shows when the scenario was modified. The company may have several people working on a spreadsheet model, and several people may have defined various scenarios. For example, the marketing department may have its opinion of what the input cells would be, the finance department may have another opinion, and the company CEO may have another opinion. Click the Merge button in the Scenario Manager dialog box. Merge Scenarios dialog box will appear. From the Merge Scenarios dialog box, choose the workbook from where you want to add the scenarios from Book drop-down list. Choose the sheet that contains the scenarios you want to merge from the Sheet list box. Notice that the dialog box displays the number of scenarios in each sheet as you scroll through the Sheet list box. production-model-marketing workbook’s Sheet1 worksheet contains 3 scenarios. Clicked OK to select these 3 scenarios to merge with the existing workbook. Click OK. You will return to the previous dialog box, which now displays the scenario names that you merged from the other workbook. If you’ve created multiple scenarios, you may want to document your work by creating a scenario summary report. When you click the Summary button in the Scenario Manager dialog box, Excel displays the Scenario Summary dialog box. Scenario Summary: This summary report appears in the form of a worksheet outline. 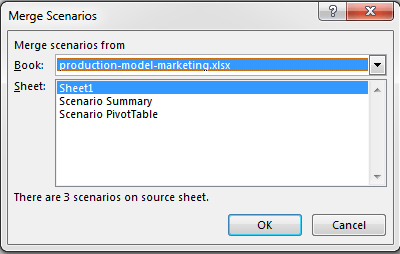 Scenario PivotTable: This summary report appears in the form of a pivot table. For simple cases of scenario management, a standard Scenario Summary report is usually sufficient. If you have many scenarios defined with multiple result cells, however, you may find that a Scenario PivotTable provides more flexibility. The Scenario Summary dialog box also asks you to mention the result cells (the cells that contain the formulas in which you’re interested). For this example, we’ve selected B13: D13 and B15 (multiple selections) to make the report show the profit for each product, plus the total profit. Note: When you work with Scenario Manager, you may discover its main limitation: namely, that a scenario can use no more than 32 changing cells. If you attempt to use more cells, you will get an error message. Excel automatically creates a new worksheet to store the summary table. The following two figures show the Scenario Summary and Scenario PivotTable form of the report. If you’ve given names to the changing cells and result cells, the table uses these names; otherwise, it lists the cell references. If you have any question on how to use Scenario Manager in Excel 2013 to do Scenario Analysis, just leave it in the comments section. I will happily answer your question. What If Analysis in Excel – A Step by Step Complete Guide. Thanks for this article, Excel Tip for IT and business integration. Thanks for the article, where can I download the sample file? please let me know if in the summary report we can define the name of the result cells. It is not meaningful to just show the cell references such as B13, C13, etc as result cells. Rather it would be great if we can define the report as profit of product a, b , etc. 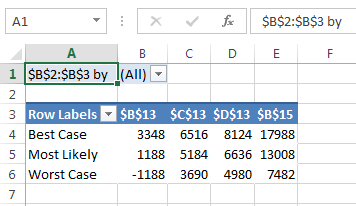 How to create a Scenario with 2 sets of changing cells ? Example: Create a Scenario named “Peak Season” with following changing cells and values ? Is there a way, using VBA perhaps that, when I change values in changing cells in the worksheet, it will automatically update the scenario without having to open up scenario manager?